Academics have called for the withdrawal of funding for a free parenting programme in Glasgow after concluding it had minimal impact. 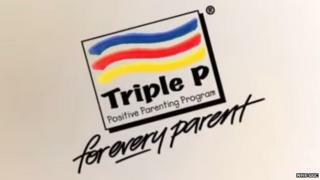 The "Triple P" system - Positive Parenting Programme - is backed by the city council and health board. The Glasgow University study said more than half of families dropped out and there were no measurable benefits. The council and health board rejected its conclusions. The health board cited a "lack of robustness". The Triple P system was designed in Australia and is now used in 20 countries around the world. The system helps families develop their own approach rather than tell people specifically how to parent. It was adopted in Glasgow in 2009 and offers one-off seminars for the parents and carers of every P1 child to intensive group-based interventions. The evaluation carried out by Glasgow University was commissioned by the Scottish government, NHS Greater Glasgow and Clyde and Glasgow City Council. It covered the period from 2009-13 when about 730 members of staff were trained to deliver Triple P.
The study was led by Prof Philip Wilson, from Aberdeen University's Primary Care and Rural Health, who is a visiting professor at Glasgow University. He said: "The lack of change in social and emotional functioning among the child population of Glasgow, together with the low completion rates for Triple P interventions, selective benefit for more privileged families and recent published evidence of overall lack of efficacy leads us to recommend that Glasgow should not commit to further investment in Triple P training or materials except within the context of independently conducted randomised trials of specific interventions." Prof Wilson's research group recommended that Glasgow adopt "alternative parenting programmes and more robust systems for monitoring activity". The report concluded that while the Triple P programme "may have been ineffective", there were reasons for optimism as "the parenting support infrastructure in Glasgow has matured substantially". NHS GGC said it "rejected the conclusions" of the report "due to its lack of robustness". It said data on which the report conclusions were based was "limited" as some parents had not completed assessment forms. The health board concluded: "The result is an incomplete evaluation based on very limited data and conclusions that do not stand up to scrutiny." Mark Feinmann, from NHS GGC's community health partnership, said: "We commissioned this evaluation to enable us to get independent views on the effectiveness of the city's parenting framework. "We are, of course, open to constructive criticism and indeed welcome weak areas being exposed. "However, our concerns regarding the quality of data and the lack of impartiality in the report means that we cannot use its conclusions to shape decision making on parenting support within the city." He added: "As such, we are now considering alternative options for an independent evaluation of our parenting support framework." A spokesman for Glasgow City Council said: "The report does identify an excellent infrastructure for parent supporting in Glasgow and says there is good cause for optimism within the city's services. "It has to be said, though, that there are many gaps in the report and it is possible some of the information it contains is already out of date. "It is clear that further work is still required if we are to understand fully the effectiveness of our parenting programmes and what is required for those services to be improved."